Thr3e Bistro ('TB'), a unique F&B mashup concept between a bistro, a wine bar and a restaurant. Not sure what you will call it, but I categorised it as Gastropub. One thing about TB, it does not conform to a normal standard norm to one classification of F&B industries. Instead the passionate owners set their sight on what they want to see their place and transform it to suit their target customers. In TB, you can have the option of seating in a comfortable chic sofa with luxurious coffee tables to sip your wine, beer and finger foods; or a proper dining tables to tuck in to selections of delectable food. On Wednesday, Friday and Saturday evening, there will be live band to set the atmosphere at TB. It also provide a nice environment to hold a private function and parties. We started the tasting with Classic Mushroom Soup ($6) and Seafood Soup ($8). The mushroom soup is creamy and you can taste the bits of the mushrooms. Served with a dash of truffle oil, it might be a delight for truffle oil lover, but for me, its a little bit of overload on the taste of truffle. The crispy bread and chips provide a contrasting texture to the dish. Meanwhile the seafood soup looks like the mini version of seafood bouillabaisse. The fish, prawn, clams and calamari are fresh. You can taste the sweetness of the seafood in the broth with the tanginess of the tomato. The seafood soup get my pick. Pan Seared Salmon with Tofu ($12) as a starter provided a good value. The salmon is well glazed with teriyaki sauce and cooked just nice. The bland yet crisp fried tofu is a good pairing to the sweet and think teriyaki sauce. There is a sweet wasabi sauce on the side for those who prefer a little kick in the flavours. Very unorthodox dish, but creative fusion dish for those looking for healthy food. BBQ Chicken Pizza ($10.50), an individual serving pizza size. The crust is thin and crispy. The toppings of bbq chicken, pineapple, cheese and bbq sauce give you the Hawaiian feel. For the mains, we tried Duck Leg Confit ($25), Black Cod ($27), Lamb Shank ($27) and Baby Back Ribs ($23). We started with the fish, as it is lighter in flavours. A thick cut of oven baked cod fish served on the bed of salsa. The cod fish has a moist and buttery feels when you bite into it. The salsa is just refreshing, while you can't hardly taste the anchovies pungent aroma from the cream. I will like it better if they pan fried the skin first to make it crispy before they oven baked it. TB version of duck confit is not the crispy type, but the texture of the skin more like roast chicken version. The meat is tasty, tender and succulent. The mashed potatoes are smooth, but the infusion of truffle oil in the mash are just not necessary. There is zigzag line of whole grain mustards on the plate aids in balancing the fattiness of the duck. Lamb shank is tasty and tender, proves that it has gone through a long cooking process. Meanwhile, the gravy is light with a nice tomato flavour. It is not starchy as they did not cook the potatoes with the shank. Instead it is pan fried later and served with some greens. You might want to give the baby back ribs a miss. It seems they just glazed the their homemade BBQ sauce before they put it on the grill and it did not absorb into the ribs. The meat is hard, dry and tasteless while the cuts are thicker than the normal baby back. They should marinate the ribs overnight with the sauces soak into the ribs; allow more moisture back into the meat and let the vinegar in the sauce to tenderise the meat. For the sweet ending, we had Chocolate Brownie with Vanilla Ice Cream ($6.50) and Panna Cotta ($5.50). The homemade brownie has a dense texture with a walnut fillings. Slightly dry and crumbled on top, it has a good thickness and goes will with the smooth, creamy vanilla ice cream. The panna cotta is also dense in texture, while the berry sauces on top provide a refreshing sweet and tangy finish for the night. 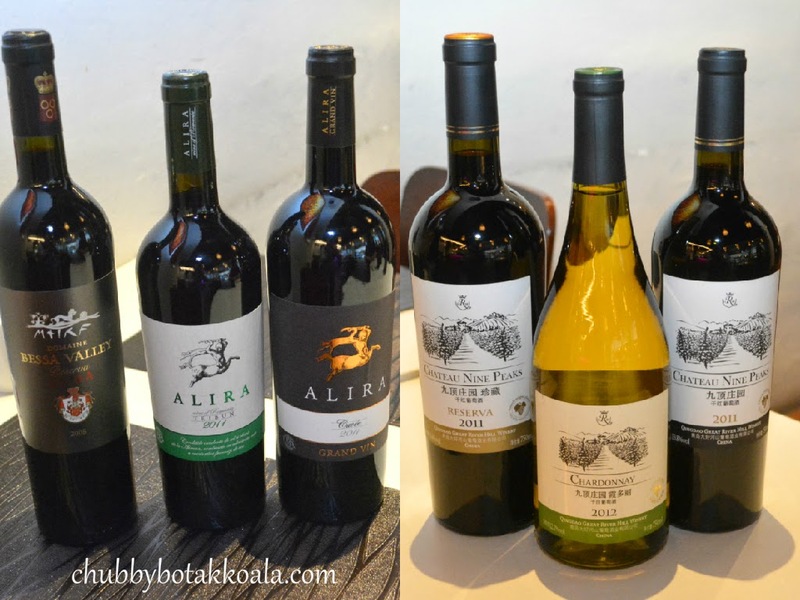 For the wine lovers, TB carries an exclusive wines from Romania and Qingdao Great River Hill Winery, where the Chateau Nine Peaks RESERVA won China Wine & Spirits Awards (CWSA) best wine in 2013. Overall, Thr3e Bistro provide a unique and interesting dining atmosphere, but definitely a good place to chill out. Their seafood dishes are the star for this place, while the rest heavier protein such as lamb or pork can be improved. So if you are around Marina Square area, give this place a try and let me know what you think. Cheers!! Thank you very much to Summer, Susan and Thr3e Bistro team for hosting this food tasting session.